If you’re sick of stubborn fat under your chin, Kybella injections may be the perfect solution for you! Kybella in Washington, DC is a non-invasive treatment that will contour your chin for a more defined jawline. This January, Bruno | Brown is offering 25% off Kybella injections. Kybella will reduce the excess fat many people have under their chin without surgery. This non-invasive treatment destroys fat cells which results in a noticeable reduction in fullness under the chin. Once the fat cells are destroyed, they can no longer store additional fat, leaving you double-chin free. This procedure takes as little as 15-20 minutes with no recovery time. You may experience mild swelling which will subside after a few days. Reality TV star, Khloe Kardashian, has been a longtime fan of Kybella. 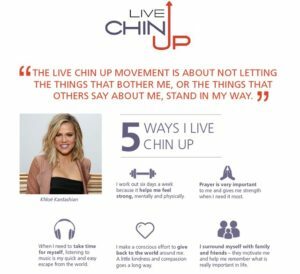 She partnered with them for the brand’s Live Chin Up Campaign, which was designed to help people keep their “chin up” and not let things that bother them stand in their way. 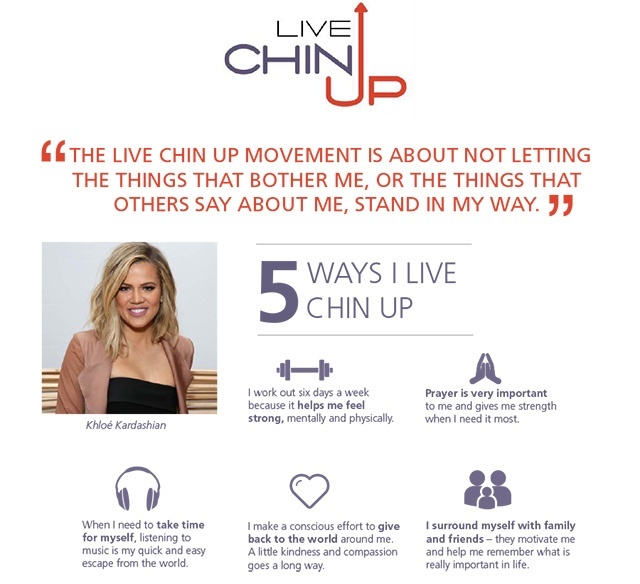 Khloe Kardashian is in favor of Kybella’s “chin up” attitude to help men and women look and feel their best. Both men and women can be self-conscious about their double-chin. Stored fat in the chin area doesn’t just plague people with excess body weight- genes and aging can cause double chins on people with otherwise ideal BMI’s. During your consultation, the doctors at Bruno | Brown will assess your chin area to determine if Kybella is right for you. They will work with you to customize your treatment and target the fat cells under your chin to reach your ideal look. During the procedure, multiple small injections of Kybella are injected into the treatment area under your chin. Kybella is administered in two treatments, and our physicians will decide if you need additional treatments based on the amount of remaining fat. Contact us today to schedule your Kybella procedure and receive 25% off this month. "My in-office lipo results are incredible. I'm thrilled to have banished the saddlebags at last and added some balance to my body shape. I could not be happier." — Jennifer P.
Disclaimer: This website provides information about popular plastic surgery procedures in the DC area, such as breast augmentation, tummy tucks, mommy makeovers, body contouring, skin care and more, and is for informational purposes only. It is not intended to be medical advice. Schedule your plastic surgery consultation today. © 2019 James R. Bruno, MD, FACS and C. Coleman Brown, MD, FACS. All Rights Reserved.